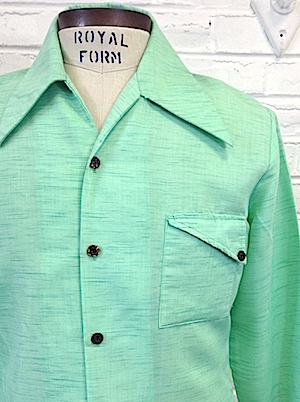 Home > Men's Vintage Shirts > Disco Shirts > (M) Mens Vintage 1970's Shirt, MINT GREEN Funky Bronze-y Buttons, Great Color! Mens Vintage 1970's Shirt! Fantastically funky Mint Green, with streaks of Darker Green that give it a textured appearance. Five Dark Bronze colored buttons with a groovy texture down the front, with two more on each cuff. 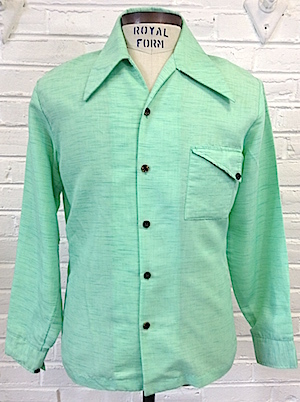 One patch pocket with a funky-shaped flap and a decorative button on the left chest. Straight hem with a long, pointy 1970's collar. Tagged by Gallery LTD. No material tag, but feels like Poly/Cotton blend (More poly than cotton though). Unique and veritably groovy.